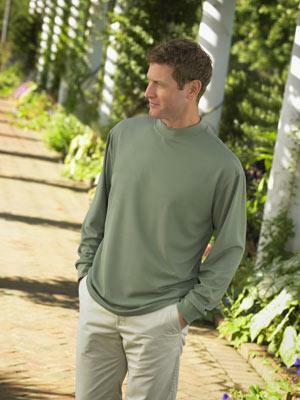 5.8-ounce, 100% ring spun combed cotton jersey knit; 3/4 length raglan sleeves. 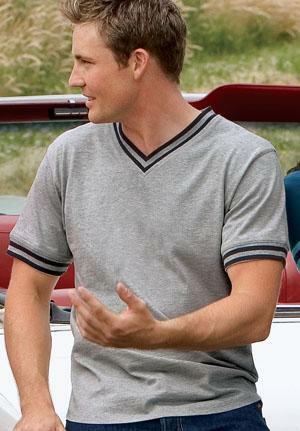 Features colorblocking on raglan sleeves and matching color on rib knit trim around the neck. 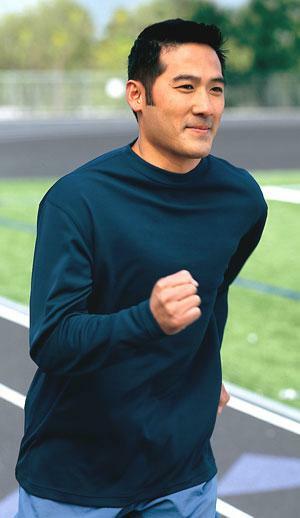 Comfortable jersey knit is also anti-pill. 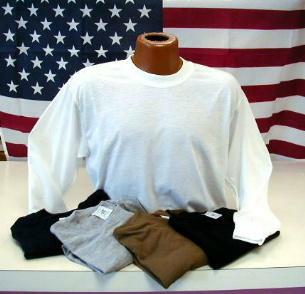 5.6-ounce, 95% ring spun combed cotton with 5% spandex. 6 oz. 85/15 poly/cotton. 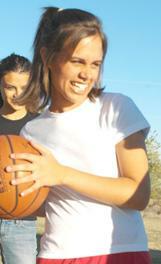 Made from a patented micro-blend, Dri-Release combines the best qualities of natural and synthetic fibers. 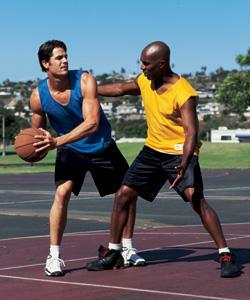 Draws perspiration away from the skin faster. Spreads moisture throughout the fabric quicker. Allows airflow to evaporate moisture from the fabric more efficiently. NAFTA Friendly. 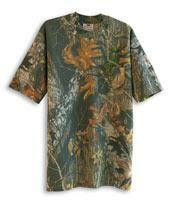 6.2 oz 85% polyester 15% cotton t-shirt. 3.7 oz 100% poly, fabric wicks moisture away from body, self-fabric collar, topstitching at collar, coverstitching at armholes, double-needle stitching at sleeves and hem. 100% CoolMax extreme Polyester 100% polyester. 5 oz per sq. yd. 3.7 oz. 100% polyester, fabric wicks moisture away from body, self-fabric (topstitched) collar and cuffs, coverstitched armholes, double-needle hem. 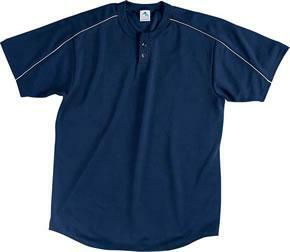 100% polyester fabric, mitered v-neck with self fabric collar, double needle curved bottom hem. 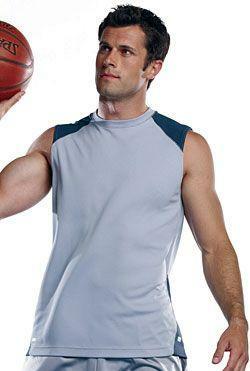 100% polyester tricot mesh tank. Fully reversible. Bottom hem of each layer finished separately to allow for embellishment. Outside locker label on bottom left. 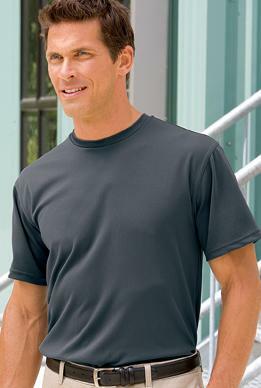 Lightweight CoolMax Short Sleeve T-Shirt. 100% CoolMax extreme Polyester. Brown color is military brown. 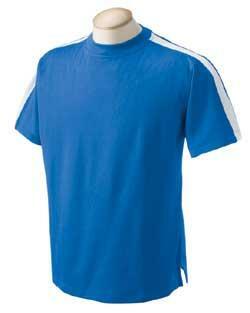 -100% Textured polyester, 70 denier mesh. 100% polyester. Fabric wicks moisture away from body. Self-fabric neck and cuffs. Set-in sleeves. Double-needle stitching on hem. 90% cotton/10% Lycra spandex, Dupont Coolmax � polyester shelf bra, binding at neck and armhole, waist length/racerback styling, double needle hem. 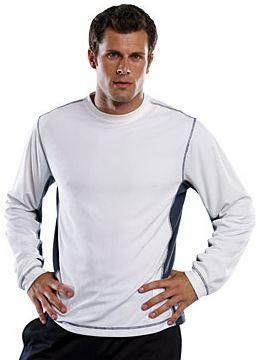 100% polyester knit interlock. 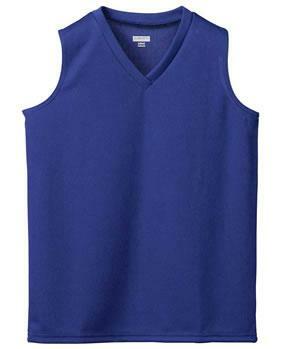 Coverstitch at shoulder, neck, armhole, sleeve and bottom hem. 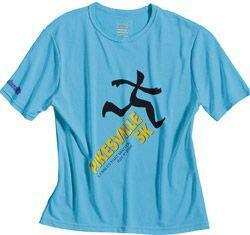 A true unisex shirt, perfect for running teams. 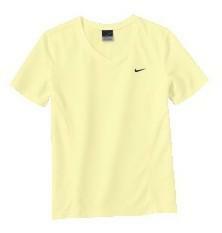 Light, breathable polyester moisture-wicking fabric. 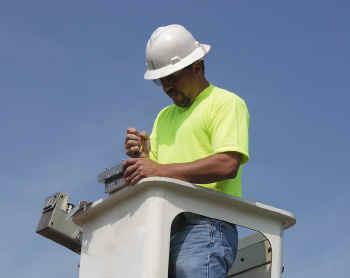 ANSI Class 2 and OSHA-compliant. 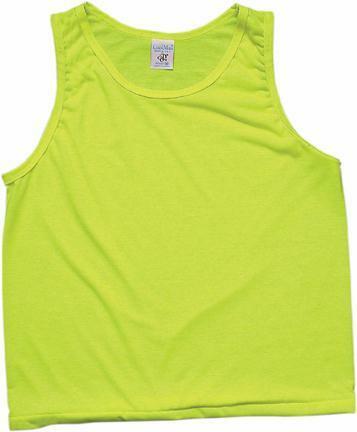 5.6-ounce, 100% polyester interlock with wicking function, high visibility fluorescent fabric. 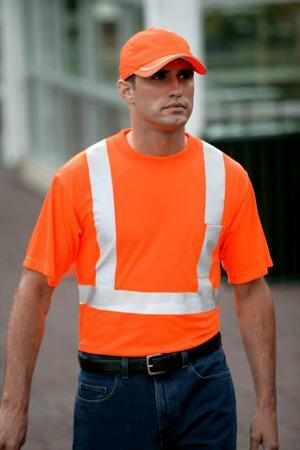 Ultra-bright coloration for high visibility. 2 vertical and 1 horizontal 2" wide reflective taping on front and back. Pocket for pens and tools. 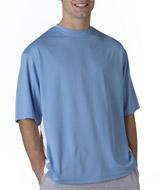 3.5 ounce, 100% poly double mesh; double needle on armholes, shoulder and bottom hem. 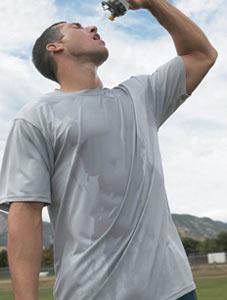 With double mesh poly, our exclusive Dri-Mesh technology wicks moisture to help you keep your cool. 100% polyester with new crossover v-neck detail and princess cut seams for a distinctly feminine look. 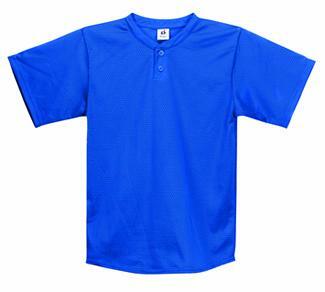 6.3 ounce, 100% ring spun cpmbed cotton jersey knit, blue/heather is 60/40 cotton poly blend; 1x1 rib knit trim on v-neck and cuffs, double needle armholes and button hem, taping on neck. 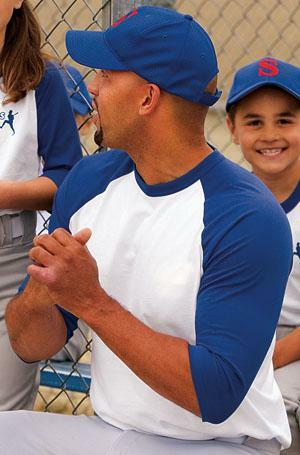 100% polyester wicking mesh, 1x1 rib-knit trim at neck, contrast color piping on front of sleeves, double needle hemmed sleeves and fishtail bottom hem, two button placket. DISCONTINUED; VERY LIMITED STOCK. 100% Polyester Moisture Management Mini Waffle Knit Mock Turtle with Double Needle Cover Stitching, Short Double Needle Hem Sleeve, Reinforced Shoulder Seam, Double Needle Cover Stitched Armholes and Hemmed Bottom. 100% polyester birdseye knit jacquard. 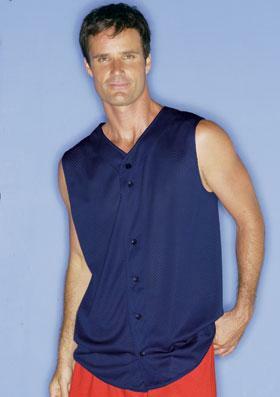 Sleeveless tee with shoulder panel and side gusset for mobility. Contrast coverstitch at shoulder and side seam. 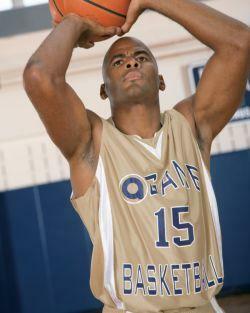 -Badger heat transfer logo on left sleeve. 100% polyester birdseye knit jacquard. Contrast insert at raglan sleeve seam for mobility, and coverstitch along armhole seam. 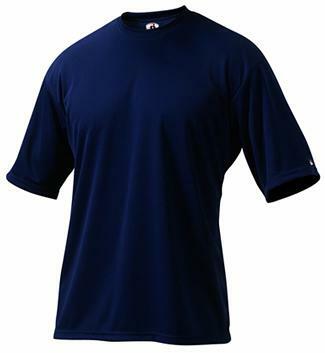 3.5-ounce, 100% poly double mesh; double-needle on armholes, shoulder, bottom hem and side vents. 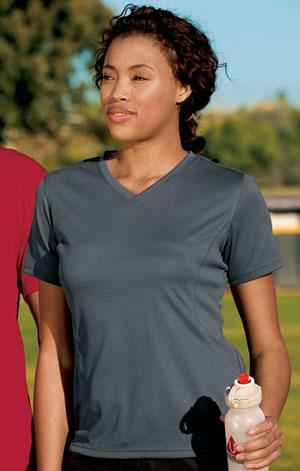 Lightweight, Breathable EnduraFit Moisture Wicking Polyester stays 95% dryer than standard cotton T. Athletic cut, ribbed knit collar, straight hemmed bottom. 100% Polyester Moisture Management Mini Waffle Knit, Long Sleeve Mock Turtle w/Double Needle Cover Stitched Armholes, Reinforced Shoulder Seam, Double Needle Hem Bottom. 90% polyester/10% spandex. Contrast stitching at shoulder, armhole and side seams. 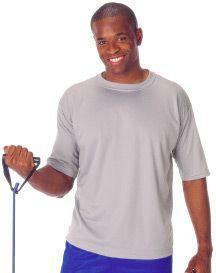 Keeps muscles warm and provides freedom of movement. 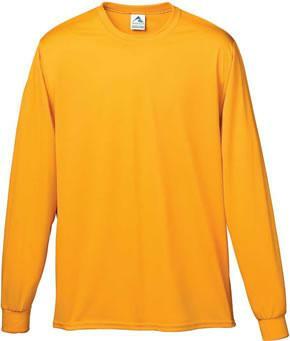 92% polyester/8% spandex knit jersey, peached for softness. Mesh panel at back and side seam for ventilation. Flatlock stitch on all seams. 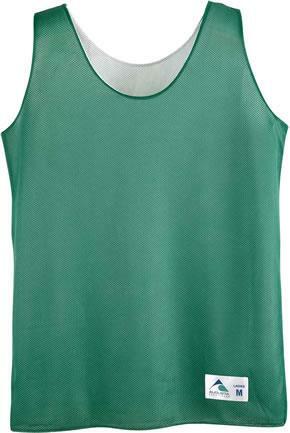 100% polyester mesh; double-stitching throughout. 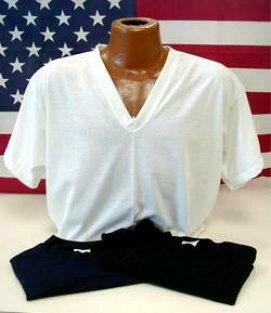 Solid colors with tonal shoulder stripe: White, Black, New Navy. Solid colors with contrast shoulder stripe. 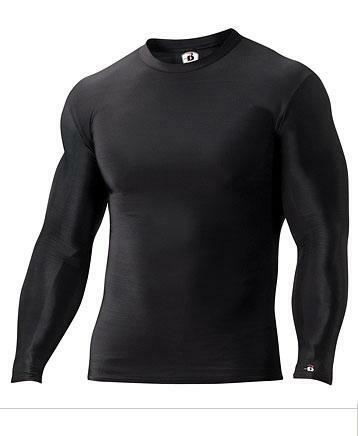 Uniquely constructed from 4-way stretch fabric, these form-fitting shirts maintain body temperature by quickly transporting moisture away from the skin - for less muscle fatigue. Works well under a jersey or football pads. 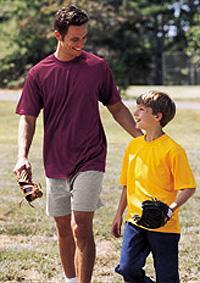 4.9-ounce 79/21 poly/spandex blend. 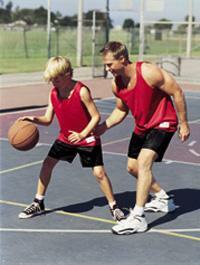 Antimicrobial technology helps control odor. 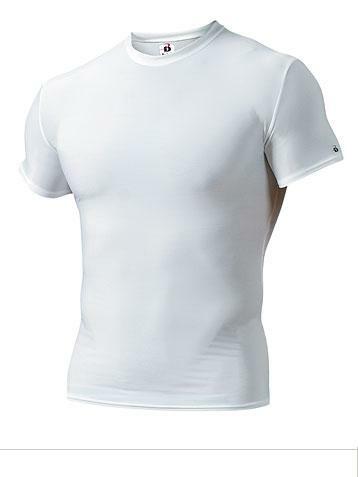 Pre-shrunk 100% combed cotton 5.9 ounce t-shirt. Screenprinted with "Redsand" and the Redsand icon on lower right back. Embroidered icon on right sleeve. Double-needle stitching throughout. 100% Polyester. � Zip front with a-game zipper pull. 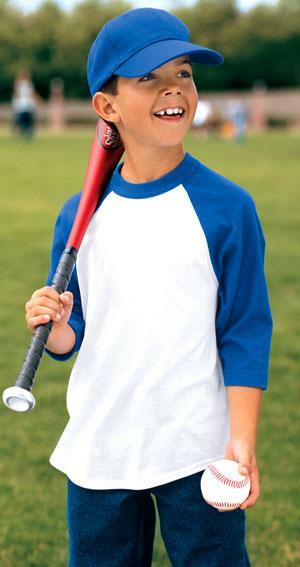 Hemmed raglan short sleeve. 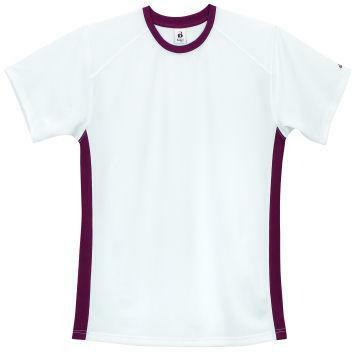 Body is made of flat back mesh with lower front contrasting panel. Front and back inserts have mesh panels for ventilation. 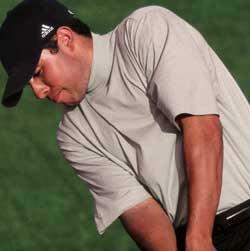 Knit collar with contrasting double stripes. 1" Droptail with side vents. 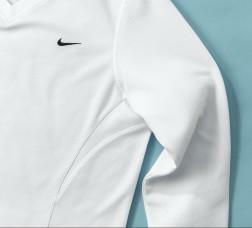 Upper body, sleeves, back and side panels are white. 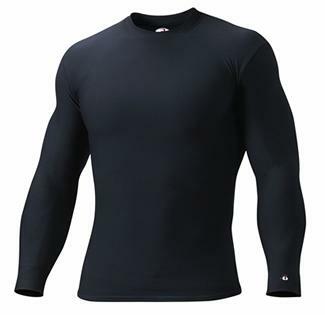 Lightweight, Breathable EnduraFit Moisture Wicking Polyester stays 95% dryer than standard cotton t. Athletic cut, ribbed knit collar and cuffs, straight hemmed bottom. 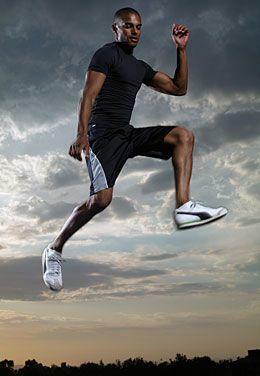 Lightweight, Breathable EnduraFit Moisture Wicking Nylon/Lycra is like a second skin. Stays dry and helps regulate body heat. Quality construction, hemmed bottom. 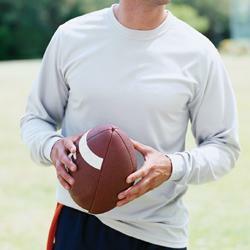 3.95 oz., 100% Polyester/Moisture Management/Antimicrobial/B-Mesh. Badger sport paneled shoulder for maximum movement. Contrast side panels. Self-fabric collar. Double-needle hem with tack. 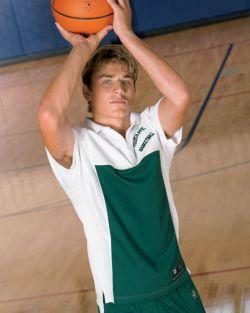 Badger heat transfer logo on left sleeve. 100% polyester birdseye knit jacquard. Contrast panel at side seam and underarm. Contrast coverstitch at shoulder, armhole, sleeve cuff, and bottom hem. 100% polyester birdseye knit jacquard. Contrast panel at side seam and neck seam. 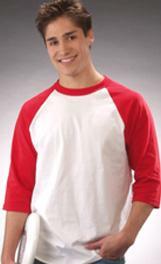 Contrast coverstitch at raglan sleeve, side panel, sleeve and bottom hem. 90% polyester/10% spandex. Contrast stitching at shoulder, armhole, side seams. 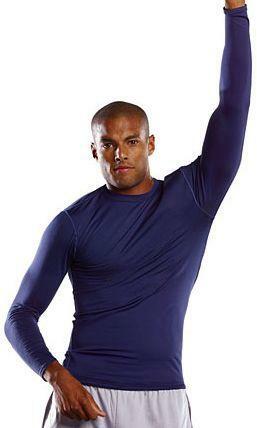 Keeps muscles warm and provides freedom of movement. 60% Cotton/40% Polyester. Exceptional ability to breathe. 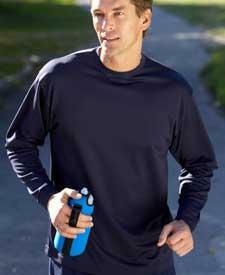 100% polyester Coolmax Extreme with UV and anti-microbial finish. Heat-sealed neck label. 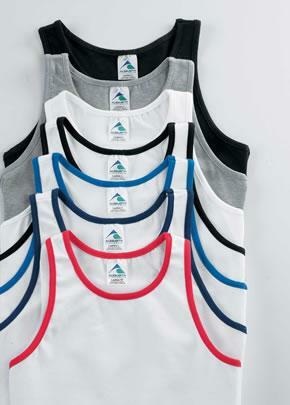 Contrast adidas performance logo on back of neck. 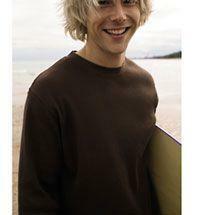 Rib-knit collar. Two-button placket. 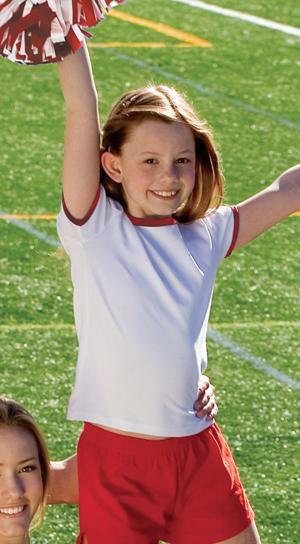 Set-in, open-hem sleeves. Contrast jacquard mesh side panels and sleeve hems.